Cassidy Starnes, Clay Montgomery, and Erin Pope of the Gallipolis FFA Chapter recently competed in the State Job Interview Career Development Event held at the Ohio State University on December 2, 2017. For this CDE, students were evaluated on a personal cover letter and resume, an interview, and a follow-up letter at the conclusion of the event. Cassidy Starnes placed 7th the in the Senior division,Clay Montgomery placed 10th in the Junior division and Erin Pope placed 3rd in the Freshman division. Congratulations to all for your state performance. Pictured from left: Jerrod Ferguson, Gallipolis FFA Advisor, Cassidy Starnes, Clay Montgomery, and Erin Pope. Cassidy Starnes, Clay Montgomery, and Erin Pope of the Gallipolis FFA Chapter recently competed in the State Job Interview Career Development Event held at the Ohio State University on December 2, 2017. For this CDE, students were evaluated on a personal cover letter and resume, an interview, and a follow-up letter at the conclusion of the event. Cassidy Starnes placed 7th the in the Senior division,Clay Montgomery placed 10th in the Junior division and Erin Pope placed 3rd in the Freshman division. Congratulations to all for your state performance. 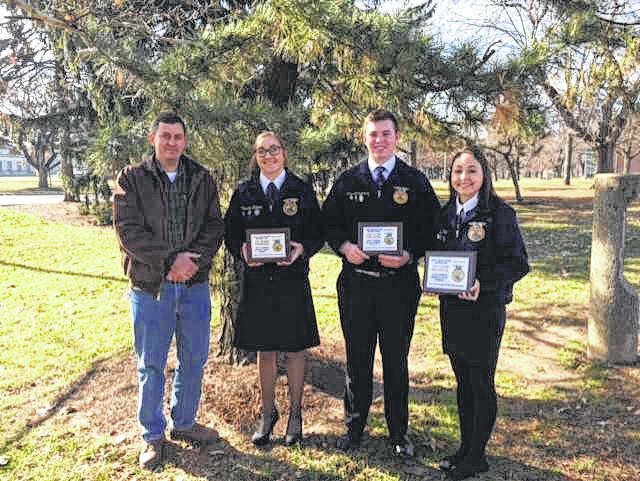 Pictured from left: Jerrod Ferguson, Gallipolis FFA Advisor, Cassidy Starnes, Clay Montgomery, and Erin Pope.